Today is my birthday so I thought it was the perfect time to share one of my favourite chocolate recipes. There was an old version of this recipe but this one is so much better and much easier too. 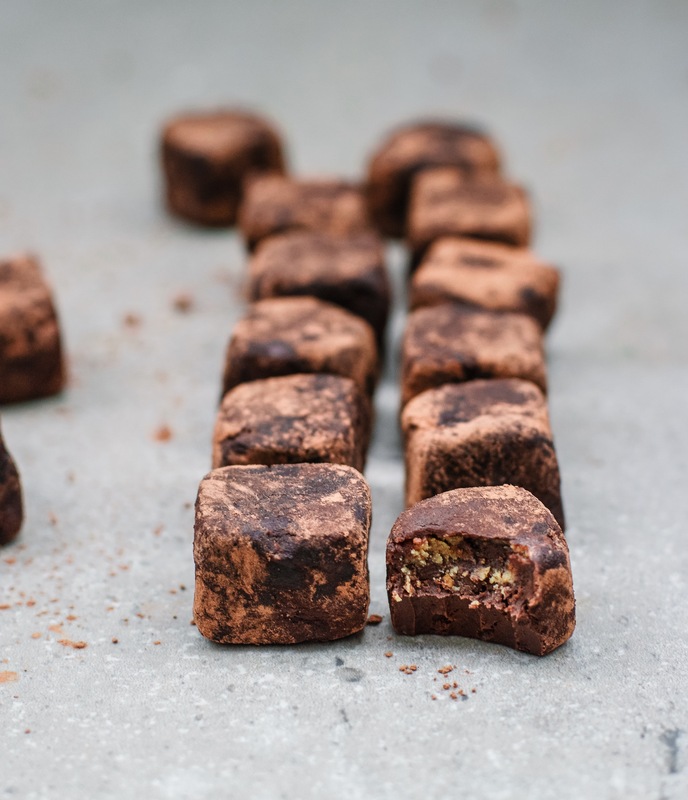 These hazelnut praline truffles are little bites of heaven, they’re smooth and creamy with the perfect amount of sweet and nuttiness. I love making them for after dinner treats if I’m having people over and they’re especially perfect for festive munching this time of year. Add the chocolate to a bowl and microwave it until just starting to melt. In a small saucepan, heat the coconut milk and coconut sugar until it’s just coming to the boil. Whisk in the hazelnut butter until smooth. Slowly pour the hot coconut milk over the chocolate and stir it very gently as it melts the chocolate. If you whisk it or stir too vigorously it will go stiff so stir it very gently, just until the combined. 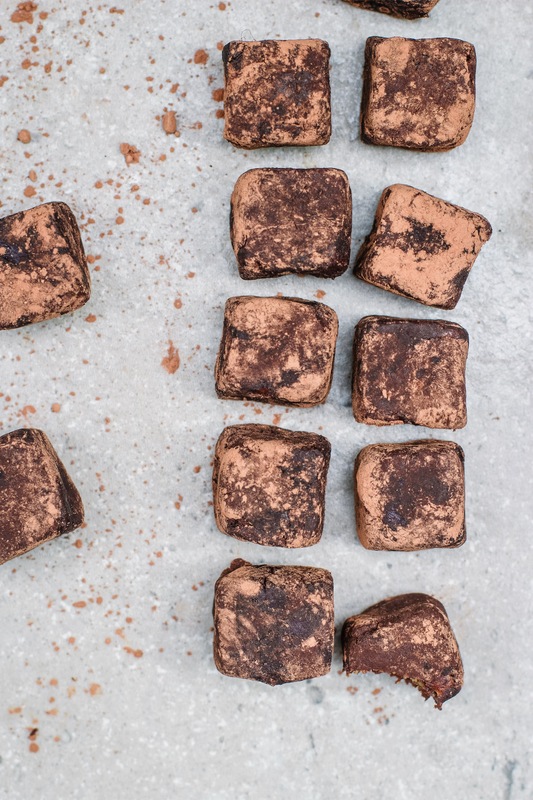 Place a layer of clingfilm over the mixture, so that it is touching the chocolate (this will stop a skin forming) and pop it in the fridge for about 2 hours until firm but scoopable. MOST dark chocolate does contain milk. Sorry. It is NOT suitable for vegans nor those with diary allergies. Yes many dark chocolates do contain milk products but I think anyone who is vegan or who has a serious dairy allergy has brands that they know suit them or is aware of what to look out for, as I’ve stated in previous posts. Good heads up though! Would it be possible to use pecans or another form of not for the filling? Definitely gonna try this recipe it looks delicious! Absolutely divine and so easy to make! Thanks again for a great recipe. Made these. They are AMAZING. Just wondering how long they will keep? I have them in a sealed bag in the fridge… I can’t imagine they will last very long though. They actually lasted near the two weeks! They are perfect for my sweet tooth – too filling to eat too many! And I made a batch for visitors at the wkend. They wouldn’t believe that they were homemade. Thought they were Butlers chocolates! Thank you for this recipe Indy, I cannot wait to try these out. Happy birthday to you, have a lovely day. Happy Birthday to you ???? Can I use chopped hazelnuts instead of hazelnut butter as I don’t have it at minute. Thanks, love your recipes and oh a Very Happy Birthday. where can you buy hazelnut butter ?? Can I ask is the coconut milk from a can or a carton? Just wondering …is the “80l” of coconut milk meant to be 80ml? !